My dear readers, this is a very special post for me. This post is to celebrate 50 fans on my face book page ( https://www.facebook.com/TummyTales) When I started the blog and created the face book page to share recipes, I was just doing something I always wanted to even as a kid cook and share recipes. However, the support and encouragement you have shown only drives me to keep raising the bar. It is said that behind the success of a man there is a woman; in my case there are two. My dear mom and my sister who have been encouraging and supportive in the blog, my mum has also willing opened her treasure of recipes some of which you have already seen on the blog. Each and every recipe passes through their stern exacting standards and only the perfected product makes it to the blog. Thanks dear mum and little sister. To be honest, I don't cook because I have to blog or vice versa, I cook because it’s a passion for me and the reward is when someone tries a recipe from the blog and it turns out well. Thank you very much dear readers do keep writing with your thoughts, suggestions and comments. It would be nice to hear from you on what you feel on the face book page or the blog. And so, to celebrate the 50th fan, we will make something that is synonymous with celebrations in India. Did I hear a loud and collective "Gajar Halwa”? Yes, absolutely right! We shall celebrate with the gajar halwa, a desert so rooted in Indian culture that Indian women can almost make it blindfolded. Its cousin the Doodhi (bottle gourd) halwa also has an equally good reputation but it’s the gajar halwa that calls the shots nevertheless. 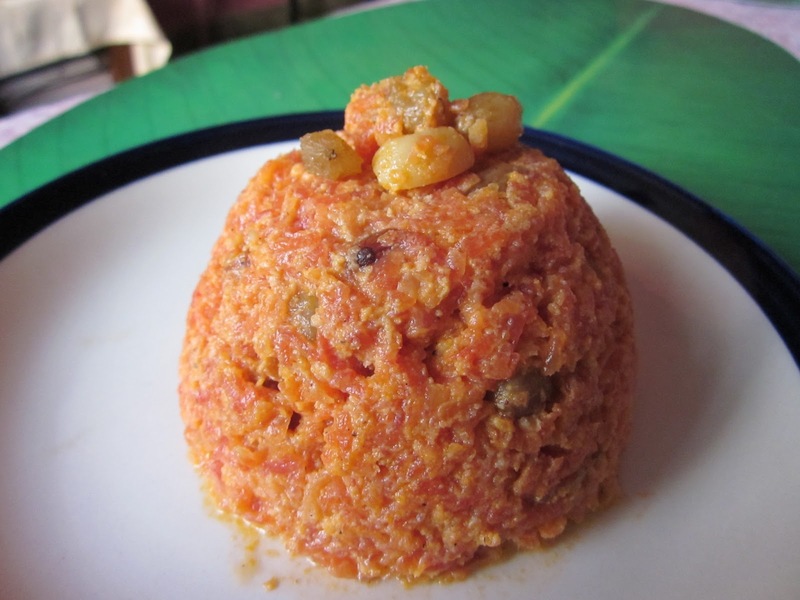 The test for a good gajar halwa is simple. It should melt the minute you put it in your mouth. This is also the right time to try out this recipe since carrots are best in this season. I tried my best to retain the original recipe and keep it as low as possible on the calorie meter as possible. Fortunately, it passed the quality test and here you have moist, succulent and melt in the mouth gajar halwa. Make it. I'm sure the accolades and compliments will follow. · Wash, peel and grate the carrots and keep aside. Roughly chop the dry fruits as well. · In a deep pan, add ghee. When the ghee is heated, add the dry fruits and lightly fry them. Once done, take out and drain on an absorbent paper. In the same pan, add chopped carrots and sauté those for about 7 minutes till the carrots are limp. · Add in the milk and the green cardamom powder and cook till the milk has dried up. · Now add the condensed milk, sugar and mix well till sugar has dissolved and the mixture forms a single mass. Please keep stirring continuously at this point or your carrots may burn near the bottom. 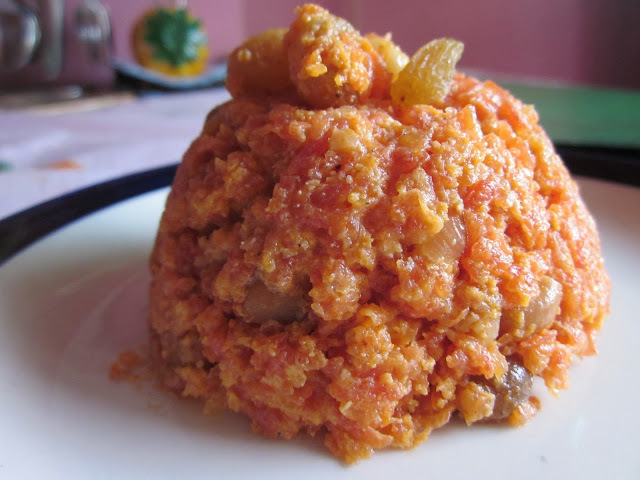 · Add the dry fruits and give it a nice mix so the fruits are spread evenly throughout the halva. · This can be served cold or at room temperature. But it tasted best when it’s hot. · Want to indulge a bit more, add a small blob of ghee on your portion. Thanks Anusha. I am glad you liked it. Please do try and let me know how it turned out.